TeenCoder: Windows Programming teaches the fundamentals of writing computer programs. The course uses the Microsoft C# programming language. It is designed for high-school students who want to learn computer programming. Microsoft C# is a leading edge programming language. It is designed for building applications to run on Microsoft’s .Net platform. The C# language is an International Standards Organization (ISO) approved standard programming language. ~Don’t miss the giveaway at the end! Plus, Hodgepodgemom has a review and giveaway of the KidCoder series at Hodgepodge. We received these Homeschool Programming resources in exchange for an honest review. All opinions are our own and we love the benefits and blessings we are continuing to see from this multi-age study. Please see our disclosure policy. What Does Homeschool Programming – TeenCoder Include? 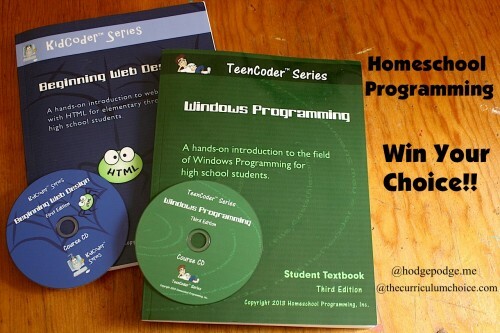 The TeenCoder: Windows Programming course includes a textbook and CD. A set of video lessons are also available for the visual learner. The CD contains most of the material needed to complete the course. In addition to the course CD, the Microsoft Visual C# 2010 Express needs to be installed on the computer. Visual C# 2010 Express is a free edition of Microsoft’s C# language. Chapter one leads the student through the installation of the software necessary to get started. You will need an Internet connection during the initial Visual Studio download and installation process. What Age is the TeenCoder series Designed For? The course is designed for high school teens. Great for elective credit. The only prerequisite is that the student is familiar with using the computer. Knowledge of navigating with the mouse, opening and saving files, and browsing the Internet are the only skills that are needed to start. A companion course, TeenCoder: Game Programming builds on the concepts taught in the Windows Programming course. The two courses (Both Windows Programming and Game Programming) will provide two semesters–a full year of study. The course begins with background in the history of the DOS and Windows operating systems. Beginning with DOS, the first chapter walks the student through the successive PC operating systems. Once the student has the operating system background, the text turns to a discussion of the evolution of Windows programming. The first chapter ends by walking the student through installing the software necessary to complete the course. 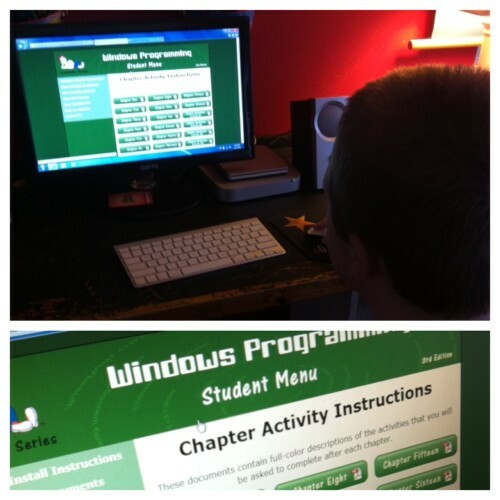 Our 9th grade son is studying the Windows Programming course. He says the lessons are easy to follow, and fun. The course material does an excellent job of guiding him through each lesson’s steps. It walked him through installing the software. Each lesson details the problem to be solved, and the approach necessary to solve it. This method got our son quickly generating visual programs; I believe early successes were key to holding his interest in the course. He is looking forward to completing some of the games that are included in later lessons. 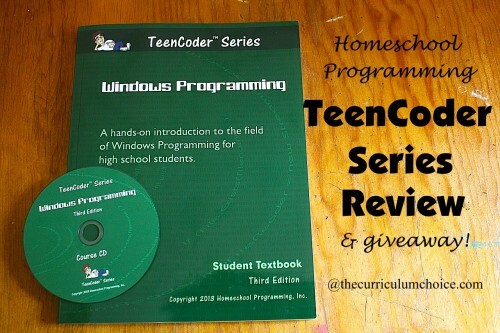 Where Can You Find Homeschool Programming’s TeenCoder series? TeenCoder is available from Homeschool Programming for $75.00. And that’s not all! Homeschool Programming offers many more courses – check out all the offerings on the Homeschool Programming site! The next in the TeenCoder series is Game Programming. Both courses together offer a full year’s worth of homeschool programming. 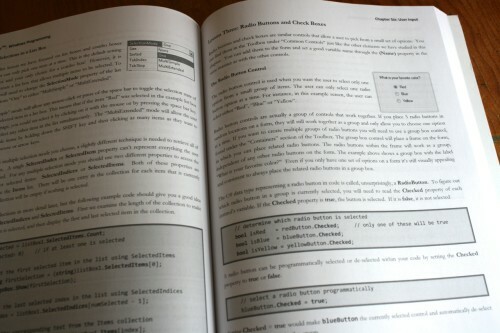 —– > > Try Sample Pages of TeenCoder and more in the series. Don’t forget to stop by the KidCoder review and giveaway at Hodgepodge! ~Steve keeps busy with five children and a job in information security. He has a second job as principal of the Hodgepodge homeschool and also writes for Habits for a Happy Home and Passionate Purposeful Parenting. You can find more of his technology reviews here at Curriculum Choice. I think my highschooler would like this! I hit “submit” to early! I have never heard of Homeschool Programming. I haven’t really thought too much about how to incorporate computer science into our homeschool. I saw this in one of my homeschool catalogs but didn’t have enough money to get it. I would like to try them both. I have a elementary and a middleschooler so both would be great. love these programs. I would love to incorporate this in my children’s studies. Yes, Steve, this is a great program. My son learned a lot from it, too, and our review was as positive as yours! It’s well worth the investment for a high school credit. My 14 year old daughter and I were just looking at this the other day. She wants to learn programming, so I was going to add it to next year’s schedule. If we win, she can start earlier! Thanks! What timing! We just finished the first chapter of the KidCoder Window’s Programming book a couple of hours ago. I’m really impressed so far and would love to get more of the series. I have been looking at this as a gift for my grandson. It will mean buying him a computer, but I consider it an investment in his future. This is new to me, but I have a boy who would be over the moon if he had this as part of his school studies! I’ve heard of Homeschool Programming, but we haven’t had the opportunity to try it. The kids had lots of fun during the Hour Of Code event so this would be a treat for them. I had not heard of Homeschool Programming, but I am interested as I have a son who would like to learn. I have heard of Homeschool Programming. I have been considering purchasing this series for my children to use as a high school elective. I am striving to give my children a broad range of electives to let them see all the things that are available to them in life. Thank you for this opportunity. This is really a great blog! have all the set of information about the homeschooling curriculum. This serves as a good resource for many of the homeschoolers and their families. Many of the people i have come across they have a confusion in the curriculum selection, this helps them the most. Will this work with a Mac computer?